The CEM AC2000 interface to Salto off-line locks allows communication with the Salto server and control of cardholder access permissions to off-line locks, directly from AC2000 Access Control System. This seamless interface supports bi-directional communication with the Salto system utilizing SHIP (Salto Host Interface Protocol). The Salto off-line locking solution offers flexibility within any project where cabling is an issue. Salto off-line locks can be installed on almost any type of door ranging from narrow profile, aluminium doors, heavy duty doors, panic bars, glass doors and many more. With the Salto off-line lock solution no cabling is required to the actual lock installation. 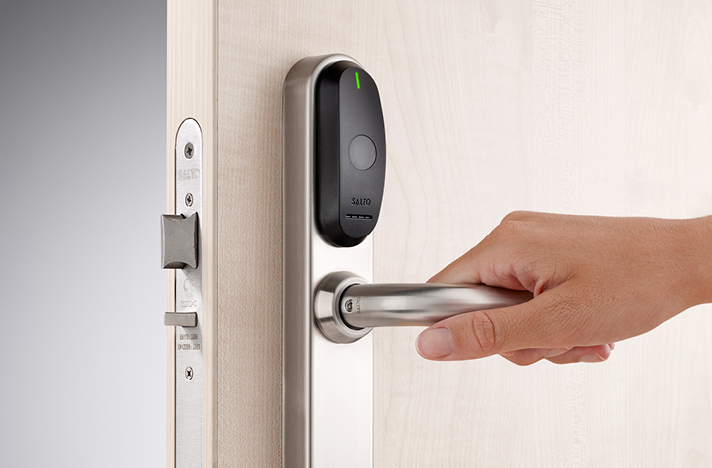 If required, door inputs can be wired separately to CEM online devices for real-time monitoring. Virtually unlimited number of off-line locks supported. Off-line lock control is suitable for storage areas, office spaces etc. where real-time security monitoring is not a priority. Flexible design that can be fitted to almost any type of door. High level interface via Ethernet between AC2000 and off-line lock system using SHIP (Salto Host Interface Protocol). Salto online readers to update cards for off-line reader access. Off-line transactions synchronized with AC2000 Server. Based on SHIP specification v1.19b.